Dimensions: 11 5/16" x 12 17/32"
Frank Lloyd Wright changed the way American families lived with his revolutionary designs for the Prairie house. The decade between 1899, when the first true Prairie house appeared, and 1909, when the architect left the Midwest for Europe, has been called Wright's first Golden Age. The Boynton House of 1908 is among the last of Wright's Prairie Style residences and is noteworthy for its remarkable and abundant fenestration. The dining room in particular is flooded with both natural light from the two-tiered breakfast bay window bands and indirect light cast by the multiple ceiling light panels. 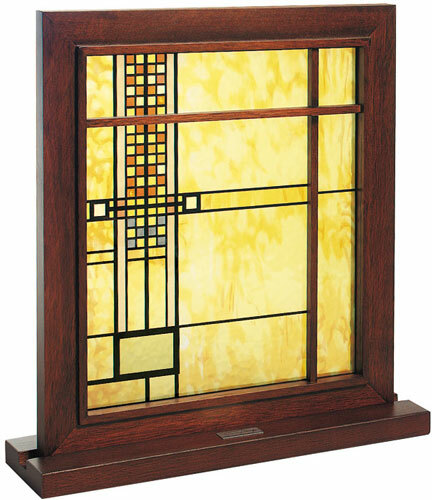 The dining room light panel is the source of this reproduction. The wooden strips used in this design not only serve to mark divisions between the individual sections of glass, but also serve as major elements of the design itself. In addition, the small checkerboard pattern repeats a design element of the table lights, the glass doors of the dining room sideboard and the surround band of windows to unite all the decorative elements in the room.